The criminalisation of low-level opium cultivation in India is driving intergenerational poverty and inequality, but a new policy approach would reverse these harms and empower rural communities. Health Poverty Action (HPA), a UK-based non-profit organisation, recently published the findings of their research into the impact of punitive drug policies upon vulnerable groups in India, as well as Brazil. The report (Punishing poverty: How the failed ‘war on drugs’ harms vulnerable communities) sheds light on the marginalisation and deprived living conditions of rural communities in northeast India, and how earnings from illegal opium cultivation have become the only viable economic prospect for many impoverished locals. The findings are a result of a series of interviews and focus groups conducted by researchers in 2017, in an undisclosed area of northeast India. Without adequate access to education or employment, many of the region’s rural people – over a quarter of whom live in poverty – seek to make a living through agriculture. However, the climate and much of the terrain are inhospitable for the cultivation of crops that are both sufficiently lucrative and quick to mature. Many farmers have thus turned to the cultivation of kani (opium poppy) to support themselves and their families. Such unlicensed production remains strictly prohibited under India’s key drug legislation, the Narcotic Drugs and Psychotropic Substances Act (NDPS). Someone found producing, possessing, or transporting even a "small quantity" of the plant without a license faces up to one-year imprisonment and/or a fine of up to ₹10,000 (£108/$138). A farmer found contravening the law will also have all their opium crops seized or destroyed. But with little alternative income, farmers routinely risk it all for a chance to make a living through opium production. The impact of these policies upon marginalised and impoverished people should not be understated. 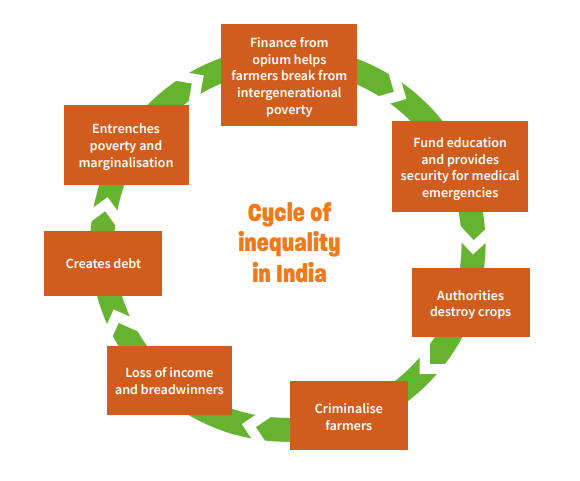 The criminalisation of poor farmers not only worsens deprivation in rural communities, it can trap them in an inescapable cycle of poverty. “Our livelihood is dependent on the kani cultivation because there is no other source of income”, one local told HPA’s researchers. “At the time of family members falling ill or injured at home, the government does not support or help us. If we do not have money to pay to the doctors or pharmacists then there is a possibility of losing that family member who falls ill. In such times of emergency, only kani can help us to get money”. Many local respondents also reported that income from opium cultivation allowed them to send their children to school outside of their communities, to pursue an education that could uplift the family from intergenerational poverty. Nonetheless, authorities regularly enter these communities for crop eradication, and have reportedly brutalised locals who try to prevent them from doing so. Security forces do not only destroy the opium poppies; in the process, they eradicate the hopes and aspirations of some of India’s most marginalised people. Adding insult to injury, eradication usually takes place just prior to harvesting, meaning that farmers lose more than just the value of the plants’ sale; they also lose all money and resources invested into seeds, irrigation, and general maintenance of the farm. In conjunction with the expensive fines imposed, this eradication approach is enough to drive rural people into abject destitution and hopelessness. Alternative development, an approach aimed at countering drug production and supporting rural farmers by providing them with substitute crops has failed to improve people’s livelihoods in the region. HPA’s report describes how such state-run schemes have been largely futile due to “to low technical knowledge of these cash crops amongst farmers, specific climatic requirements for the alternative crops, lack of water in the region, the length of time (two to three years) for the plants to mature, and a lack of associated support services from the government such as agricultural subsidies, training and capacity building for farmers”. Poor infrastructure also creates transport difficulties for farmers who must sell their alternative crops in distant areas, an unappealing prospect given they are able to sell their harvested opium locally. Replacing opium with other crops is also problematic for locals due to the widespread consumption of the drug in the region; it is used for religious and medical purposes, as well as “recreationally”. Problematic use has become increasingly prevalent among young people, and there is a lack of services to treat those affected. The health impact of youth opium use is cited by local farmers as a key reason for them wanting the resources and opportunity to stop cultivating the plant. While the punitive approach to opium is continuing to wreck or destabilise many rural people’s lives in northeast India, there is a way out of this, if the government is willing to consider evidence-based alternatives to the status quo. Instead of a focus on law enforcement and punishment, the government should work towards understanding communities’ needs and supporting their integration into the legal economy. If the government seeks to reduce cultivation, it must support regional farmers to earn steady incomes that sufficiently improve their livelihood. If the government seeks to reduce problematic opium use, it must invest in accessible treatment services. As HPA note, “this will not be possible without first building trust and dialogue among farmers, communities, and authorities. This can occur once forced eradication stops and farmers are no longer subject to fines or criminal penalties for cultivation”. The criminalisation of farmers and the eradication of crops are cruel and unrealistic goals, particularly due to the entrenched nature of kani in these communities’ culture and lives. The purpose of drug policy should be harm reduction: to minimise the harms associated with drug use and the drug trade. The current approach exacerbates the harms of both. Investing in the welfare of rural opium-farming communities, instead of criminalising their behaviour, would provide some of India’s most marginalised people with an opportunity to escape the cycle of inequality and poverty. Read Health Poverty Action’s full report: Punishing poverty: How the failed ‘war on drugs’ harms vulnerable communities. The report brings together the experiences of some of the most marginalised communities affected by the so-called ‘war on drugs’ in India and Brazil.